The Liberal media and the political Left are presenting a face of Islam that is not factual. On this episode, Dr. Lake has an honest discussion with Dr. Timothy Furnish about the beliefs of Islam, as well as their Eschatological views. Dr. Furnish has a Ph.D. in Islamic/Middle East, African, and World History from Ohio State University. He has been a consultant to US Special Operations Command and Intelligence Community, he has served both as an Arabic linguist for the 101st Airborne Division, and as a Chaplain. He has appeared on numerous news networks, to include Fox News. And his credentials extend well past this short list of accomplishments. 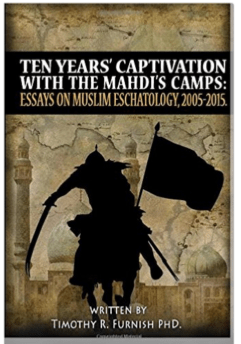 Ten Years’ Captivation with the Mahdi Camps: Essays on Muslim Eschatology, 2005-2015. These books on available at Amazon.com. For those that reside outside the United States, these books are also available on the Kindle.